Ellsberg allowed for the possibility that a handful of humans would survive, such beach dwellers on South Pacific islands subsisting on mollusks. But civilization as we know it would end. Nuclear weapons systems today are very different from the 1950s and 1960s. There are fewer nuclear weapons now than there were then. And we the public don’t know the nuclear strategies of the United States and other nuclear-armed nations. But Ellsberg said there are still enough nuclear warheads to potentially doom the human race, and there is no reason to believe that nuclear strategies have changed. I was born in 1936 and grew up the early nuclear era. Unlike many, I never feared nuclear war. I figured that only a madman would start a nuclear war and neither the United States nor the Soviet Union were led by madmen.. I was living in a fool’s paradise. The decision to use nuclear weapons was not reserved to leaders such as Eisenhower or Khrushchev. If only the President could authorize use of nuclear weapons, then an attacker could paralyze the United States by targeting its leaders. Of necessity, the authority to push the nuclear button was delegated through the military chain of command, first to theater commanders and then to their subordinates. Ellsberg told of interviewing the commander of an Air Force base near the 38th parallel in Korea, living in Quonset huts and in command of bombs with more explosive power than all the bombs used in World War Two combined. He listened to him talk about the circumstances in which he might go ahead and launch an attack on his own without explicit authorization—for example, when communications were down and it seemed likely that his military superior had been killed. The Soviet Union went further. It created an actual equivalent to the Doomsday Machine depicted in the 1964 movie, Dr. Strangelove (which Ellsberg said he regarded as more of a documentary than as fiction). The Doomsday Machine in the movie was set to automatically destroy the world if a nuclear bomb hit the Soviet Union. The actual system, referred to as the Dead Hand, was set to automatically launch the whole Soviet nuclear arsenal when on receipt of certain data (seismic, electronic, infrared, radioactive) indicating a nuclear attack on Moscow. It was not intended to be a Doomsday Machine, but, because of the nuclear winter phenomenon, it would have been. Ellsberg said the Russian Dead Hand system still exists. He thinks all governments with nuclear weapons—China, India, Pakistan, Israel and others—have either a Dead Hand system or wide delegation of authority to launch nuclear weapons or both. If the purpose of nuclear weapons was deterrence, one would think that nuclear-armed nations would publicize how easy it would be to set off a nuclear war. But the opposite is true. The Dead Hand systems and the delegation of authority to launch nuclear weapons are closely guarded secrets. Successors to President Eisenhower looked for alternatives to massive retaliation, starting with the “flexible response” policy of the Kennedy administration and similar initiatives later on. None of these alternatives came to much. There is a chilling military logic behind Eisenhower’s strategy. If the United States goes to war with a nuclear-armed nation, there’s a strong chance that nation will use nuclear weapons rather than accept defeat. Rather than face that possibility, it’s logical to use America’s own nuclear weapons at the outset. Hillary Clinton said during the 2008 Presidential debates that no American President should ever take the possible use of nuclear weapons off the table. Since 1945, no American President has. Ellsberg said he knew for a fact that President Kennedy and Defense Secretary Robert McNamara, had decided in their own minds that they would not use nuclear weapons under any circumstances. But what neither Kennedy, McNamara or their successors were willing to do was to give up the power to threaten nuclear attack. This brought the world to the brink of war in 1961. The USSR had far fewer nuclear weapons than most Americans realized at the time. To redress the balance, Nikita Khrushchev attempted to place nuclear missile in Cuba. John F. Kennedy threatened war to force them out. Khrushchev eventually backed down. If Khrushchev had held on for just one more day, Ellsberg said, there almost certainly would have been war. Soviet ships and nuclear submarines would have attempted to cross the blockade line, and the subs would almost certainly have launched their missiles. Unknown to Kennedy, the 40,000 Soviet troops in Cuba were armed with tactical nuclear weapons, which almost certain would have been used. American generals and admirals, many of whom were eager to attack the USSR while the United States still had a margin of superiority, would have responded with massive retaliation, and that would have spelled doom. Khrushchev’s decision to withdraw was not weakness, but heroism. He alone put the survival of the Soviet people and also the American people ahead of Soviet geopolitical advantage and his own political career. Probing investigative hearings on our war plans in the light of nuclear winter. Forgoing delusions of preemptive damage-limiting by our first-strike forces. Giving up the profits, jobs and alliance hegemony based on maintaining that pretense. All of this should be common sense. But it cannot happen without a huge change in pubic opinion, or in the thinking of the American military establishment. It is hard to imagine catastrophe before it happens. People living in Ukraine before the Chernobyl disaster, people living in New Orleans before Hurriance Katrina, the people living in France, Germany and Russia in 1914 or 1939 could not have imagined what was in store for them. I can’t imagine nuclear war—not on a gut level. But as has been said, it is possible to ignore reality, but it is not possible to ignore the consequences of ignoring reality. Dismantling the Doomsday Machines by John V. Walsh for The Unz Review. Excellent. Disregard the comment thread. 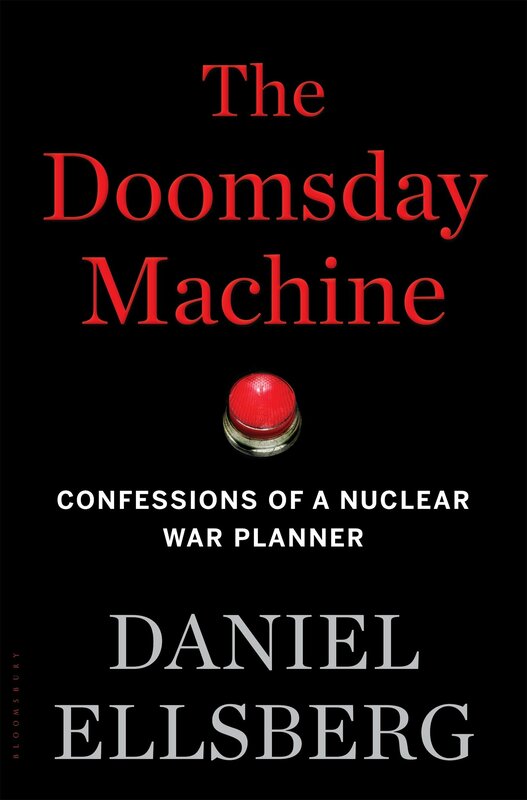 Daniel Ellsberg on dismantling the doomsday machine, an interview for the Bulletin of the Atomic Scientists. Reality Asserts Itself – Daniel Ellsberg, a series of interviews for The Real News Network. This entry was posted on February 6, 2019 at 6:42 am and is filed under Books, History, War and Peace. You can follow any responses to this entry through the RSS 2.0 feed. You can leave a response, or trackback from your own site. A line on the logic of nuclear deterrence that sticks in my head: ‘the reason for nuclear weapons is nuclear weapons, and all murders are also suicides’. It’s frightening to see the zeal some people in my country too apparently have for obliterating millions of innocents.